Casual luxury, genuine hospitality, and a keen eye for quality are the hallmarks of the Rendez-Vous, with spaces and places perfect for a week’s worth of fun and relaxation. Rendez-Vous’ Barge Manager, Spencer Hayes, has been in the barge industry since 1993. He has established longstanding relationships in the Burgundy area, and is well connected to local sommeliers, working artisans, and prominent community members. In addition to managing and supervising the Rendez-Vous, Spencer does the same for the 6-star, 8-passenger Grand Cru and the 5-star, 8-passenger Prosperite, both also cruising in Southern Burgundy. In the afternoon, you will be met by a crew member of the Rendez-Vous at the designated meeting point. From here, relax as you are chauffeured to Rendez-Vous, moored in the village of Fleurey-sur-Ouche. A traditional champagne welcome and introduction to the crew awaits you, before your first gourmet dinner onboard. The journey continues with a morning cruise. Laze on deck in the hot tub, or explore the countryside via bicycle. This afternoon, your Tour Guide accompanies you to Clos de Vougeot, where Cistercian monks made wine in the 12th century. Explore the preserved presses on which these iconic Burgundian vintages were made. Then it’s back to present day pleasures with a winetasting in the vineyards of the Cote de Nuits. Return to the Rendez-Vous and relax with drinks and dinner onboard. Begin the day with a drive through the Cote d’Or vineyards to the charming town of Beaune, the region's wine capital. The methods of making mustard are revealed during a tour and tasting at the factory Fallot, the last independent mill in Burgundy. After free time to explore the local market, enjoy luncheon ashore at a charming bistro. Next, visit the Hospice de Beaune, an immaculately preserved Medieval hospital built in the 15th century. Return to the Rendez-Vous where Chef is putting the finishing touches on tonight's delicious dinner. Relax on the deck with a freshly brewed cup of coffee during today's morning cruise. This afternoon, your Tour Guide escorts you to Chateauneuf-en-Auxois, a village perched atop a hill overlooking the Canal. Chateauneuf's imposing position refers to its history as a 15th century fortress. A tour of the Chateau reveals architectural details and timeworn relics which speak to the deprivations and decadence so prevalent in France’s history. Chef presents dinner onboard. Experience your final cruise this morning with a cup of coffee on deck while soaking in the ambiance of the tranquil countryside. This afternoon, your Tour Guide accompanies you to the prestigious vineyards of the Chateau de Chassagne Montrachet for a private tasting of their boutique wines. The Picard family, who haved owned the domaine since 1951, will open the doors to its cellars, dating back to the XI and XV centuries. Return to the Rendez-Vous for cocktails and canapes, and then finish your cruise in style at the Captain's Dinner. 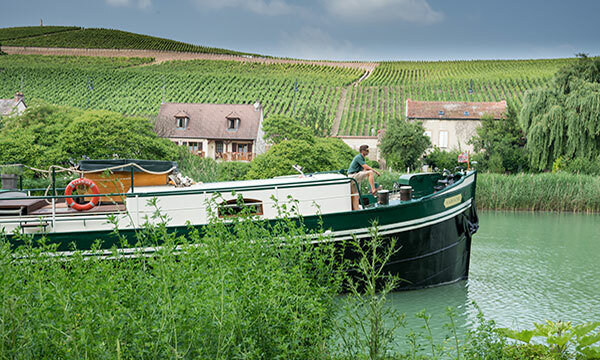 Discover an Authentic "Domaine Bourguignon"
This morning's cruise is the perfect time to laze in the hot tub on deck, or take a leisurely stroll or gentle pedal on the towpath. This afternoon, enjoy a wine tour in the world-famous vineyards of the Cotes de Beaune during an escorted excursion to an authentic "Domaine Bourguignon". Discover a private wine cellar built in the 16th century by the Cistercian monks, and then sip, sample, and savor at a winetasting. Return to the Rendez-Vous and relax with drinks and dinner onboard. Admire the beautiful scenery during the morning cruise to La Bussiere-sur-Ouche. After lunch, the golfers will be chauffeured to Norges Country Club to play at their 18 hole course. The guide will accompany the non-golfers to Chateauneuf-en-Auxois, perched atop the hill overlooking the canal. A tour of the Chateau reveals architectural details and relics which speak to the deprivations and decadence so prevalent in France’s history. Back onboard, take an evening stroll or a bicycle ride along the towpath as Chef prepares dinner. Today begins with either a bicycle ride to Beaune, a 20-mile route, or ride with our vehicle. Upon arrival, your Tour Guide introduces Hospice de Beaune, an immaculately preserved medieval hospital in use until the early 20th century. Afterwards, browse Beaune's lively pedestrian area, lined with shops and cafes. Enjoy lunch at a lively local bistro, and then tour and taste at the last family owned mustard factory in Beaune. Return to the Rendez-Vous and laze on in the hot tub or socialize in the salon. Chef presents dinner onboard. As Rendez-Vous cruises this morning, explore the towpath on foot or by bicycle. 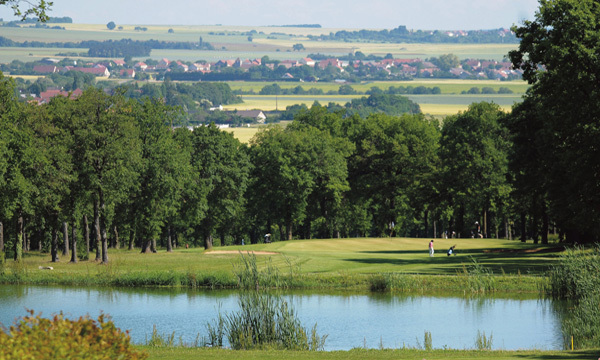 After lunch, the golfers will be driven to Golf de Beaune Levernois, located deep in the wine country. Meanwhile, the non-golfers will be accompanied to visit Clos de Vougeot, where Cistercian monks made wine in the 12th century. The ancient Clos now serves as the headquarters of the wine society Chevaliers du Tastevin. Discover the preserved presses from which these Burgundian wines were first produced. A private tasting at a local cellar follows. Everyone is reunited onboard for dinner. The town of Dijon offers a pleasurable assault of the senses. "Les Halles”, the region's food market, presents a panorama of colorful produce while public gardens are vibrant with greenery. Shop, stroll, and sip your way through this small city brimming with authentic French life. After lunch, the golfers will be chauffeured to Chateau de Chailly, an 18 hole parkland course with raised greens and a restored Medieval chateau as backdrop. Non-golfers will return to Rendez-Vous for an afternoon cruise. Enjoy a final feast at the Captain's Dinner. Cruise from Vandenesse-en-Auxois to Fleurey-sur-Ouche on the Canal de Bourgogne. 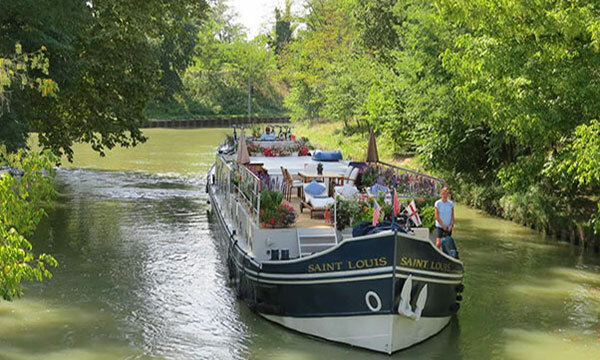 In the afternoon, you will be met by a crew member of the Rendez-Vous at the designated meeting point, moored on the enchanting Canal de Bourgogne. From here, relax as you are chauffeured to the barge moored nearby. A traditional champagne welcome and introduction to the crew awaits you, before your first of many gourmet dinners onboard. This morning the barge will begin her gentle journey along the canal. Guests can bicycle at their leisure, or simply laze on deck and admire the countryside vistas glide by. 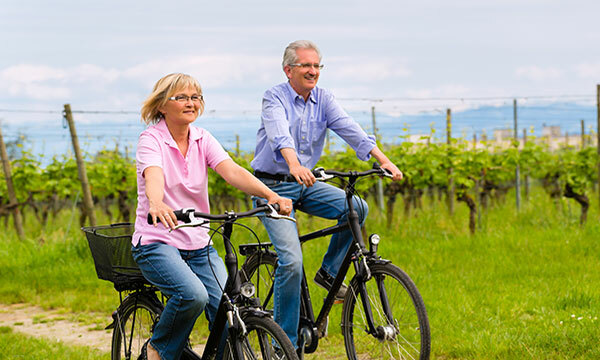 In the afternoon, guests can bicycle approximately 20 miles to Chateau de Chassagne-Montrachet for an introduction to locally produced wines and, of course, a tasting. Return to the barge for cocktails and dinner. This morning, enjoy breathtaking scenery during a customized bicycle tour through Burgundy's manicured trails and towpaths. 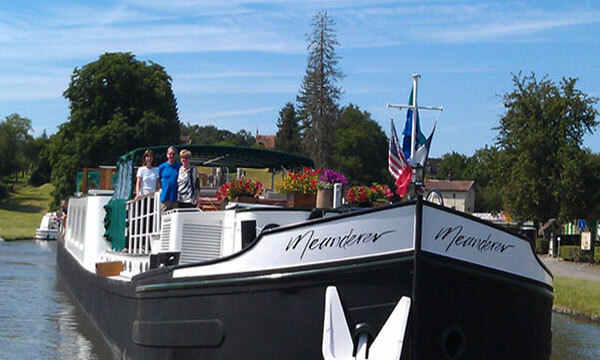 Upon mooring, your Tour Guide introduces Chateauneuf-en-Auxois, a hilltop village perched overlooking the canal. Chateauneuf's imposing position reflects its history as a 15th century fortress. A tour of the Chateau reveals architectural details and timeworn relics which speak to the deprivations and decadence so prevalent in France’s history. Return to the barge and join Chef in the open kitchen as he crafts tonight's dinner. town’s boutiques before returning to the barge for drinks and dinner. Please note: The services of the Barging and Bicycling Adventure include semi-customized cycling routes; detailed route maps; GPS devices; and the phone numbers to the crew. A barge vehicle can follow the bicyclers for assistance. Bikes onboard the Rendez-Vous are VTC Original 520 gris blue b’twin, 21 gears; the vessel carries 3 26 inch frame bikes and 3 28 inch frame bikes. For riders desiring more advanced bicycles, a rental may be arranged at the expense of the guest. This is a sample itinerary which may be subject to change depending on local conditions.